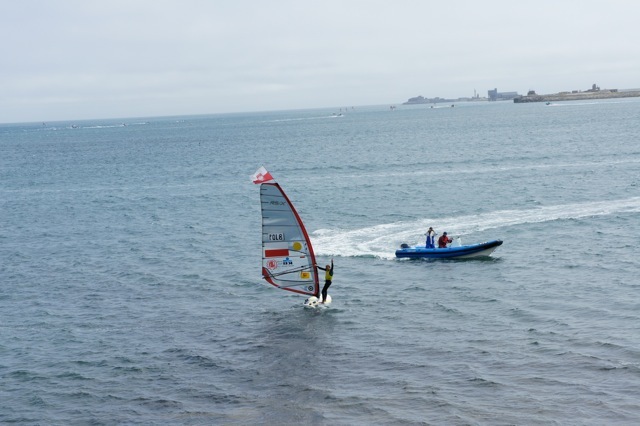 Olympic Test Event: Predicting the windsurfing outcome of the Games? Last week top Olympic sailors wrapped up the Olympic Test Event at the Weymouth and Portland International Sailing Academy. The regatta came with a few significant changes from the format of a normal World Cup regatta, including a week-long venue closure immediately before racing, a staggered schedule for the different classes over more than 10 days, and daily course changes for each Olympic-class fleet. Affecting the boards the most was the daily course change. Although most sailors hadn't previously trained much outside of the harbor, the fleet adapted well to sailing in the new areas and conditions. After training solely inside the protected harbor, most of the boardsailors welcomed the chance to see the big outside world of Weymouth Bay. The race committee did a good job of keeping the boards on the closer courses, as they recognized the disadvantages boardsailors have when being towed by a coach boat, or having to sail long distances to get to a course. Altogether, the boards used three different courses: the Weymouth Bay West Course, the usual Portland Harbor Course, and the stadium-like Nothe Course. The Weymouth Bay West Course differed the most from the harbor. Big cliffs on one side of the course make it extremely puffy and shifty, and the encroaching big Atlantic swell enters the bay perpendicular to the wind, making planing upwind and working the waves more challenging. It's a course that needs a bit of extra time to get rigging and technique dialed into the conditions. Like the harbor, there was a strong coast effect near the cliff walls on the right side of the course, making that side favored for most of the racing. The course was about an hour's sail downwind from the launch at WPNSA, making pre-race preparation more critical - especially when it came to packing food, water, and warm clothing for the long sail or ride back. After sailing in a civilized fashion in the harbor for so long, this course seemed much bigger and wilder, but I had prepared well in San Francisco by sailing in the cold ocean swells outside the Golden Gate Bridge. The most challenging racing was found on the Nothe Course, which is also the course where the medal races are held. 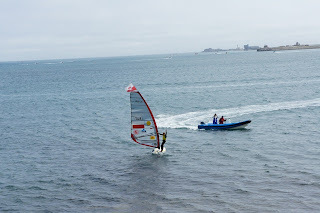 This course is similar to sailing in a stadium - the course is enclosed between the outside wall of the Portland Harbor and the headlands of the Nothe Fort, a Victorian-era military structure atop a big, grassy hill. For spectators, the course offers a supreme and almost bird's-eye view of the racing; for the competitors, it means an incredibly gusty, shifty and challenging day. I tend to enjoy this kind of racing because it requires a lot of thinking and deciding where to go. Sailors can gain or lose a lot of ground by virtue of one decision, and when you're behind, there is always an opportunity to make up distance. Altogether, the course changes didn't affect the outcome of the racing too much. Successful Olympic-class sailors need to sail strongly in all conditions, and the RS:X women's fleet leaders weren't affected by the unusual conditions found on the new courses. Over the course of the last year, the fleet leaders have been working on the weaknesses in their sailing, and the leaderboard is finally beginning to shuffle around a bit. Most noticeable is the sailing of Zofia Klepacka, the eventual gold medalist in the event. Coming to her full strength after the birth of her son over a year and a half ago, she has an incredible, relaxed attitude. Her performance in light wind has improved drastically, and as she has always dominated in a breeze, her event was about as close to perfect as it comes. The new conditions suited her entirely. Zofia awed the crowd watching the RS:X medal race when she took an early lead after the first leg, which kept growing, reaching almost three quarters of a leg in front of the rest of the fleet at the slalom finish. She finished 16 points ahead of Marina Alabau of Spain, the silver medalist. Taking the bronze medal was Bryony Shaw of Great Britain. In the men's fleet, Dorian van Rijsselberge of the Netherlands fought it out with Nick Dempsey of Great Britain the entire regatta, swapping places every day in an impressive battle of fitness and tactics. Dorian eventually took the gold with a one-point lead over Nick. Powerhouse Polish sailor Przemek Miarczynski inched into bronze with a one-point lead over New Zealand sailor JP Tobin, who won the medal race. With the fleet leaders so close in points, it is difficult to predict the actual order of the medal count. However the order, the outcome of the actual Olympic Games will be similar. No matter the condition or course, the fleet leaders are sailing consistently well, and their level will only advance as their countries single out resources for them in the upcoming Olympic year. Although I'm not leading the regatta, I was extremely satisfied with my performance. Competition is really tough throughout the middle and even rear of the fleet, and many technical problems I was experiencing in the beginning of the season have been ironed out. I'm going faster and I've got a whole new set of items to work on. I'm pleased my coaching program has worked out well this year, and I'm making a new plan for the fall and winter. Everyone is looking forward to the Europeans in Bulgaria, the next event on the schedule, which will be very competitive. This is my fifth regatta at the site of the 2012 Olympic Games, and along with many other competitors, I'm very familiar with the venue and how to get around. However, this time it's not just racing as usual here in Weymouth, UK. The Pre-Olympics are run exactly as the Olympics are meant to be, and many changes are evident, both on the racecourse and the organization of the event. I had two weeks of training in Weymouth before the Pre-Olympics, and the build-up to the event was vastly different. The organizers completely shut down the Weymouth and Portland National Sailing Academy for a week to prepare the facility for the competition, which left a few sailors like myself, out of a place to train. One week of training, organized with a French coach, Christophe Boutet, and a training partner, ended up a little confused. Because we weren't given exact instructions what to do, and were under the instructions that one ramp at the Academy was still open, we sailed from there until we were kicked out. We finished the week with our gear stored in the coach boat every day, rigging wherever we could! After the Academy was re-opened, we received credentials and, finally, a big tent to store equipment, complete with sweet rubber matting to rig on. All the boats at the Academy had been moved out for the event, including the community kayak and windsurfing programs. Although there are many international teams competing here, with only one team per country and an offset racing schedule, the venue is strangely quiet. The US Sailing Team has been preparing for this event as well and our storage facility is recently redone with new rooms, a TV, X-Box, PT room, drying room, gym equipment, and a giant vinyl USA national flag on the wall. The USSTAG PR team is here along with our team leaders, weather guy, trainers, and best of all, a chef! We now have optimal external conditions, and although I am still financing housing, food, and coaching myself, the structure here makes it easier to focus on training and racing. Not only are changes are evident to infrastructure, but the racing has changed drastically for the boards as well. For the past three years I've raced here, the boards have raced solely in the harbor area. Now, the organizers are switching the courses daily for all the classes, so the womens' RS:X fleet is racing outside the "kiddie pool" of the harbor the entire week. It's a whole new world outside the fast, flat water and walls of the harbor, and yesterday we were racing in the big swell, chop, and big gusts of Weymouth Bay. The courses are far from the harbor for boards, and sailors without a coach boat are left with the potential for more than an hour's sail out to the starting area. The change was a big surprise to the entire fleet; everyone trained for months before the event in the harbor only. We're all in the same situation, but apart from the long distances from the harbor, the new courses are a good change to the racing. Racing has begun already and we've had one day of good planing conditions in big swell. I'm doing a lot of things right, but my speed upwind still needs a lot of work. However, I was pleased with my performance yesterday during starts and choosing strategies. I really enjoyed the interesting conditions and am looking forward to sailing on another new course today. Check out the USSTAG's new website where you can find updates from the racing, results, and a report from yesterday. At the bottom of the interview, there are links to the USSTAG's Facebook page and Twitter. Check out this video interview as well! If it's not the current video, you can find it by scrolling down on the sidebar.